The Delhi High Court today directed Nimbus Communications to provide live feed for the cricket match between India and Sri Lanka to be played on February 17 in Visakhapatnam. Sachin Tendulkar today joined India’s list of fitness concerns with a stiff back and would be “rested” for the fourth and final cricket one-dayer against Sri Lanka on February 17. Shaun Pollock produced a masterly bowling performance as South Africa crushed Pakistan by nine wickets in the fifth one-day international at the Wanderers Stadium here last night to take the series. South Africa’s Jacques Kallis (left) and AB de Villiers celebrate after guiding their team to victory in the fifth one-dayer against Pakistan in Johannesburg on Wednesday. Australia’s stand-in captain Mike Hussey is determined that the world champions not lose their position at the top of the one-day rankings under his leadership. 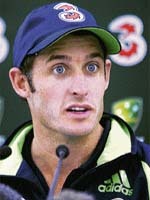 Mike Hussey is leading the Australian team in the Chappell-Hadlee series against New Zealand beginning on Friday. Zimbabwe selected 18-year-old left-hand batsman Friday Kasteni in its squad for the World Cup starting next month. Kasteni has played just one international match, making nine last weekend against Bangladesh. The International Cricket Council has set in motion the process of identifying its next President, beginning with the scrutiny of the two nominations — from Indian cricket board President Sharad Pawar and England and Wales Cricket Board Chairman David Morgan. In a thrilling late-night clash, Sania Mirza staged a brilliant rally and snatched victory from the jaws of defeat to keep Indian hopes alive in the Bangalore Open WTA tournament. Top seed Mara Santangelo of Italy and Melinda Czink of Hungary entered the quarterfinals of the $ 175,000 Sony Ericsson International WTA Tennis Tournament here today. Defending champion Santangelo struggled against Akgul Amanmuradova of Uzbekistan in the tie that went to full three sets. It was double delight for Delhi on the tennis court as they annexed both the men’s and women’s team titles at the 33rd National Games here today. The men’s final was a repeat of the previous summit clash as Delhi blanked Tamil Nadu 2-0 to retain the gold they had won in the last edition of the games at Hyderabad in 2002. Spanish import Santi Freixa’s goal in the dying moments of silver time enabled Sher-e-Jalandhar to prevail upon Maratha Warriors 3-2 in a nail-biting PHL match at the Sector 42 Hockey Stadium here tonight. Shiv Kapur excelled with a fine four-under 67 and stood at tied third place after the first round of the Enjoy Jakarta Astro Indonesia Open today. Kapur, who missed the cut last week in Malaysia, was two behind the leader Chawalit Plaphol (66) and one behind second placed Finn Mikko Ilonen (66) at the par-71 Damai Indah Golf and Country Club in the event sanctioned by the Asian Tour and the European Tour. It was an eventful final day of the track and field events at the 33rd National Games with three meet records rewritten and a result overturned in another event. Kerala won five of the 13 gold medals on offer today to take their final tally in athletics to 12 gold, eight silver and six bronze medals. The Bench comprising Justice Vikramjit Sen and Justice JP Singh passed the order after Nimbus counsel Gopal Jain mentioned the matter before the Bench seeking protection against the show-cause notice issued by the Centre yesterday. Nimbus offered to provide live feed of the match to Prasar Bharati provided that the Centre did not take any action (suspension of licence) as mentioned in the show-cause notice served on the company. After the Centre gave an undertaking that it would not take any action, the court directed the government not to take any decision till March 9, the next date of hearing. The court also issued notices to the Centre and Prasar Bharati on a petition filed by Nimbus challenging the Ordinance, which makes it mandatory for private broadcaster to share live feed with Prasar Bharati. Earlier in the day, Nimbus had approached the Delhi High Court seeking protection from the Centre’s alleged threat to cancel its licence if it did not respond to the government’s show-cause notice by today. The denouement to a nearly month-long battle between Nimbus and Prasar Bharati came under the threat of cancellation of licence of Nimbus and a Rs 1 crore penalty under the Ordinance if Nimbus continued with his defiance and not shared the feed live. Welcoming the court’s direction, Information and Broadcasting Minister Priya Ranjan Dasmunshi said it vindicated the government's stand. After the court’s intervention following a dispute over revenue sharing with Prasar Bharati, Nimbus had been giving seven-minute-deferred-live feed of the matches between India and West Indies and subsequently against Sri Lanka. Dasmunshi said he was not satisfied with the existing powers of the government in broadcasting matters, adding that during discussion in Parliament on the Bill, he was going to press for more powers to the Information and Broadcasting Minister to control air waves on the lines of laws in the UK, Australia and New Zealand. “I could have taken strict taken action against Nimbus much earlier under the Ordinance. I had the option of stopping their uplinking and downlinking or imposing a fine of up to Rs 1 crore,” he said. “But on second thoughts, I did not do it as that will mean denying telecast to DD viewers also. So, I thought we will give them notice first,” the minister said. “Tendulkar has a stiff back and the team management has decided to rest him for the final ODI against Sri Lanka at Visakhapatnam on Saturday,” BCCI Secretary Niranjan Shah told PTI over phone. India already have minor worries over Irfan Pathan and Ajit Agarkar. Pathan has a sore shoulder and missed the previous three matches. Agarkar missed the first two ties with a bout of flu and looked flat in the third game at Goa yesterday. Besides, Yuvraj Singh is also easing his way back into the team from a three-month layoff after rupturing his knee ligament. He had a stiff back, too, and missed the first two one-dayers against Sri Lanka. Pollock took five for 23 as Pakistan were bowled out for 153. 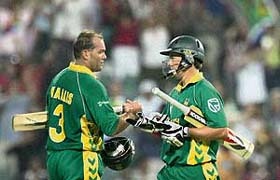 AB de Villiers and Jacques Kallis hit half-centuries as South Africa cruised to victory with 21.4 overs to spare. South Africa won the series 3-1, with one match rained off. Pollock bowled unchanged with the new ball and took the first five wickets with a superb exhibition of accurate seam and swing bowling. Pakistan hopes were raised briefly when South African captain Graeme Smith was caught behind off Mohammad Asif for nought. Asif and Rao Iftikhar Anjum bowled well and forced De Villiers and Kallis onto the defensive as the pitch seemed to gain extra life under floodlights. But then Kallis hit Iftikhar for six, four and four off successive balls and followed up with two boundaries off the next two deliveries he faced, from Asif in the next over, as South Africa took control. On a pitch with the most bounce seen in the series, Pakistan were in trouble from the first over when Pollock had Mohammad Hafeez caught behind. Imran Nazir went on the attack to make 22 off 22 balls. He hit Pollock for a six over midwicket before an attempted repeat sent the ball high in the air for Pollock to take a return catch. Pollock followed up with the wickets of Pakistan’s three senior batsmen. He bowled Younis Khan, trapped Mohammad Yousuf leg before with a ball which swerved back into the batsman, and had Pakistan captain Inzamam-ul-Haq caught at second slip. Kamran Akmal fell for 22 when he pulled powerfully against Charl Langeveldt and Ashwell Prince dived to his right in front of the square-leg umpire to hold a reflex catch. At that stage Pakistan, who won the toss, were 83 for six. The rest of the bowlers were not as impressive as Pollock but only Shoaib Malik, who made 43 not out off 70 balls, provided sustained resistance to the South African attack. South African wicketkeeper Mark Boucher, who equalled the world record when he held six catches in the fourth match in Cape Town, followed up with five catches as South Africa secured a second successive win by a large margin. After having to survive some good bowling, De Villiers and Kallis put on an unbeaten 155 for the second wicket off 175 balls. Fall of wickets: 1-0, 2-30, 3-53, 4-67, 5-71, 6-83, 7-114, 8-129, 9-135. Bowling: Pollock 10-3-23-5, Ntini 7.5-0-31-1, Hall 6-1-25-1, Langeveldt 7-0-33-1, Kallis 6-1-19-2, Kemp 4-0-18-0. West Indies: Brian Lara (capt), Ramnaresh Sarwan, Chris Gayle, Dwayne Smith, Shivnarine Chanderpaul, Dwayne Bravo, Marlon Samuels, Ian Bradshaw, Corey Collymore, Jerome Taylor, Denesh Ramdin, Devon Smith, Lendl Simmons, Daren Powell and Kieron Pollard. South Africa: Graeme Smith (capt), Jacques Kallis, Loots Bosman, Mark Boucher, AB de Villiers, Herschelle Gibbs, Andrew Hall, Justin Kemp, Charl Langeveldt, Andre Nel, Makhaya Ntini, Robin Peterson, Shaun Pollock, Ashwell Prince and Roger Telemachus. Australia’s stand-in captain Mike Hussey is determined that the world champions not lose their position at the top of the one-day rankings under his leadership. Australia’s shock tri-series defeat by England and South Africa’s series win over Pakistan have put Hussey’s side under pressure going into the Chappell-Hadlee series against New Zealand starting at the Basin Reserve tomorrow. “We’re all aware of it and we want to stay No. 1, there’s no question about that,” Hussey told reporters today. “Our main goal is playing well and winning the Chappell-Hadlee Trophy and if we do that we remain No. 1. “Certainly, the players are aware of it and we’re very determined to remain No. 1, it’s something we’re very proud of,” he said. Hussey leads an inexperienced Australian side without rested captain Ricky Ponting and vice-captain Adam Gilchrist, the injured Andrew Symonds and almost certainly fast bowler Brett Lee, who suffered an ankle injury during fielding practice today. Hussey said Australia’s standards had slipped with the two losses to England in the tri-series finals, with the start of their World Cup defence just a month away. “We probably weren’t as disciplined as we normally are, I think coach John Buchanan keeps a bunch of statistics and we did fall off a little bit in bowling and batting,” Hussey said. Hussey said despite the problems, he felt confident going into the matches against New Zealand starting with a day-nighter in Wellington. New Zealand captain Stephen Fleming, meanwhile, defended criticism of his leadership during the tri-series. “Leadership and decision-making is a massive part of my game,” he said. “I love the job, I love being with the team. What I find tiring is spending weeks when you know you’re copping it. Fleming’s body language was described as flat during the tournament in Australia and he struggled to impose himself consistently with the bat. “In some games, I’d have loved to have had another go at it, you can do 20 different things during a game,” he said. New Zealand have won only two of 22 one-day matches against Australia since 2002 and Fleming is not expecting an easy ride against Hussey’s depleted team. Melbourne: Australian captain Ricky Ponting is trying hard to be in shape for the World Cup by taking cortisone injections to ease the inflammation in his spine and avoid a surgery. Ponting said he had three cortisone injections in his spine on Wednesday as he played throughout most of the summer with a back so sore that he could hardly sleep at night. “It’s been something that has been bothering me a lot through the summer. It started on the second day of the Perth Test, which is a long time ago now (December 15),” he said. The International Cricket Council (ICC) has set in motion the process of identifying its next President, beginning with the scrutiny of the two nominations — from Indian cricket board (BCCI) President Sharad Pawar and England and Wales Cricket Board Chairman David Morgan. The ICC Nominations Committee, chaired by former BCCI President A.C. Muthiah, met in Dubai yesterday to consider the presentation from the two contenders to the post currently occupied by Percy Sonn of South Africa. Sonn’s term comes to an end in 2008. The second-seeded Sania won 3-6, 7-5, 6-2 over a cool and gritty Tatiana Poutchek of Belarus to book a berth in the quarterfinals, where she will take on unseeded Yaroslava Shvedova of Russia tomorrow. Top seed Mara Santangelo of Italy and Melinda Czink of Hungary also entered the quarterfinals. Defending champion Santangelo struggled against Akgul Amanmuradova of Uzbekistan in the tie that went to full three sets after the Italian lost the first set 3-6 and found the going tough even in the second, before recovering to claim the last two sets at 7-5, 6-2 and make it to the next round. “I was under pressure when Amanmuradova won the first set. I never thought she will finish the game. After winning the second set, I got confidence that I can make it and with determination I played and won the match,” Santangelo (ranked 33) said in her post-match comments. Czink, ranked 105, also had a tough time against her little-known opponent Su-Wei Hsieh of Chinese Taipei, losing the first set 4-6. The second set saw Czink continuing to struggle and ultimately levelling the set score in the tie breaker. The decider again saw Su-Wei pushing her opponent relentlessly. But Czink won the set 7-5. Top seed Mara Santangelo of Italy and Melinda Czink of Hungary entered the quarterfinals of the $ 175,000 Sony Ericsson International WTA Tennis Tournament here today. Defending champion Santangelo struggled against Akgul Amanmuradova of Uzbekistan in the tie that went to full three sets after the Italian lost the first set 3-6 and found the going tough even in the second, before recovering to claim the last two sets at 7-5, 6-2 and make it to the next round. Czink, ranked 105, also had a tough time against her little-known opponent Su-Wei Hsieh of Chinese Taipei, losing the first set 4-6. The second set saw Czink continuing to struggle and ultimately levelling the set score in the tie breaker. The decider again saw Su-Wei pushing her opponent relentlessly. But Czink won the set 7-5. In the doubles, third seed Ukrainian pair Yulia Beyoelzimer and Yuliana Fedak were ousted in the quarterfinals by Jarmila Gajdosova of Slovakia and Christina Horiatopoulos of Austria in straight sets 6-3, 6-3 to enter the semifinals. It was double delight for Delhi on the tennis court as they annexed both the men’s and women’s team titles at the 33rd National Games here today. The men’s final was a repeat of the previous summit clash as Delhi blanked Tamil Nadu 2-0 to retain the gold they had won in the last edition of the games at Hyderabad in 2002. Delhi then sped past West Bengal with a similar scoreline in the women’s summit clash. Divij Sharan, the tournament’s top ranked player, played a solid net game to chalk out a 6-3, 7-6 (7-3) win against the seasoned Kamala Kannan in the second singles of the men’s team final. Yesterday, Navdeep Singh put Delhi ahead by getting the better of V.M. Ranjith in the first singles 6-4, 7-5. In the women’s gold medal fight, Delhi’s Vishika Chetry scripted a convincing 6-4, 6-2 win over Shivika Burman before Parul Goswami humbled Ragini Vimal with an identical scoreline. Haryana will face Jharkhand in the women’s hockey final. Haryana routed Delhi 5-0 in the first semi-final today. Surinder Kaur struck thrice, while one goal each was scored by Jasjeet Kaur and Rani Devi. Jharkhant defeated Maharashtra 4-0. Showing great fighting spirit, the Warriors came from behind in the fourth quarter to equalise 2-2 and take the match into extra time. Till the third quarter, Sher-e-Jalandhar were leading by 2-0. With this win, Shers got two points to remain at the second spot with 16 points, while the Warriors got one point to reach a total of 11. The Shers started the match with great determination and dominance. Adopting an attacking strategy, they pierced the defence line of their rivals in the fifth minute to earn a penalty corner but missed the chance. Gagan Ajit Singh opened the account in the 16th minute by executing a reverse flick off a good pass from Tejbir Singh. Enjoying the support of the spectators, the Shers continued their attacks in the ‘D’ area. In the 29th minute, they earned a penalty corner, and it was Freixa who put the ball in with a drag-flick to make it 2-0. The Shers dominated the proceedings till the end of third quarter. The fourth quarter started on a thrilling note with some fine moves by the Warriors. They, too, adopted an attacking approach and made repeated forays into Shers’ territory. The strategy bore fruit as the Warriors earned a penalty corner in the 57th minute. Pakistani player Imran Warsi converted it to reduce the margin (1-2). Australian spearhead Jamie Dwyer scored a superb goal in the 62nd minute to restore parity. In extra time, the Shers held their nerve to win the match through Freixa, who converted a penalty corner to seal a 3-2 victory. He was declared the player of the match. Tomorrow, Orissa Steelers will take on Bangalore Lions at 7 pm. Shiv Kapur excelled with a fine four-under 67 and stood at tied third place after the first round of the Enjoy Jakarta Astro Indonesia Open today. Kapur, who missed the cut last week in Malaysia, was two behind the leader Chawalit Plaphol (66) and one behind second placed Finn Mikko Ilonen (66) at the par-71 Damai Indah Golf and Country Club in the event sanctioned by the Asian Tour and the European Tour. It was a good day for the Indians, as both SSP Chowrasia and Gaurav Ghei landed an eagle each on the same par-five 13th hole and came in with a three-under 68 each. They were both tied at sixth. Amandeep Johl went one over 71 and was tied 56th, while Rahil Gangjee had a bad day with a six-over 77, leaving a lot of work to be done to make the cut. It was an eventful final day of the track and field events at the 33rd National Games with three meet records rewritten and a result overturned in another event. Kerala won five of the 13 gold medals on offer today to take their final tally in athletics to 12 gold, eight silver and six bronze medals. 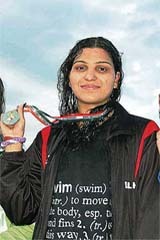 Services, Andhra Pradesh and Jharkhand helped themselves to two golds each, while Uttar Pradesh and Haryana got one each. The women’s discus throw saw Haryana’s Saroj Sihag registering a mark of 50.72m to finish way ahead of Delhi’s Priyanka Bhanot (42.75m) and her own state’s Aplesh Yadav (38.71m). The day started with a meet record in the men’s marathon as Services’ L Benning completed the race in two hours, 17 minutes and 32 seconds, eclipsing the previous mark of O Oken Singh (2h:24m:15s) set in Imphal in 1999. Preeja Sreedharan and S Arunjith became the most successful athletes at the games when they claimed their third gold medals. Preeja won the women’s 5000m in a time of 17m:01.79s to go with the gold medals she claimed in the 1500m and the 10,000m races. 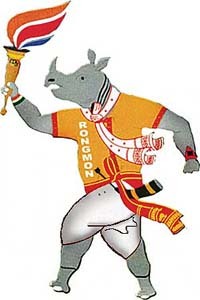 Arunjith added the 4x100m relay gold to the ones he claimed in 100m and 200m.